Leonard Barrand was severely injured in October 1915 and was unable to return to active service. He died at Bottesford in October 1919. His brother Cyril Barrand, Private 17092 of the 1st Battalion Leicestershire Regiment, was Killed in Action on the 20th August, 1916, at Mailly Maillet Wood. His brother Ernest Barrand also served in the army, as 3/16437 Private Lincolnshire Regiment, and survived the war. Leonard Barrand is one of the men on the Bottesford ‘church list’ of WW1 servicemen. He was born in 1894 in Bottesford, son of William and Elizabeth Barrand. William was born in Great Gonerby in 1847 and Barrand in Londonthorpe, near Grantham, in 1859. In April 1891 the family home lived at 8, Rutland Arms Road, Bottesford. This refers to the public house which is still there are the eastern end of the High Street, Bottesford. The precise location of this house is uncertain, but it may have been one of the dwellings located opposite the pub or it may have been a cottage in the pub yard (now the car park). William Barrand was a cottager. At that time, they had four children, Ernest (born 1881), Walter (b.1894), Lily (b.1897) and Cyril (b.1899), all born at Bottesford. William Barrand died in 1895, leaving an estate of £60.18s. Elizabeth re-married in 1897. Her second husband was William Edwards, a tailor in Queen Street, who also had a family from his first marriage. In 1901 Leonard was living at 2 High Street with his mother and stepfather, William Edwards. This was a household full of children. Leonard was accompanied by his brothers Cyril and Fred (b.1891), and his sister Lily. There were also his half-brother William Edwards (b.1899) and half-sister Ada Edwards (b.1900). The address was next to Parr’s shop at the eastern end of the High Street, probably opposite the Rutland Arms. In the 1911 census, they were in what was probably the same house on the High Street, next to George Parr’s bakery. Leonard, now 19, was employed as an assistant gardener, while his brothers Fred and Cyril were assistant butchers. At the time he enlisted, in May 1914, Leonard was employed as an engine hand with the Great Northern Railway. Leonard Barrand enlisted on the 1st May, 1914, with the 5th Battalion, Leicestershire Regiment and his Service Numbers were 1892, 265814. This was well before war was declared, suggesting that he chose the life of a regular soldier rather than remain at home. He was stationed in Melton Mowbray until posted to the UK Expeditionary Force in France at the end of February, 1915. He was then fighting on the Western Front until he was seriously injured and sent home on the 19th October 1915. He had been in hospital from the 5th to the 19th of September, 1915, and had returned to duty. He was injured again on the 17th October with a shrapnel wound to the right eye, and was treated at Étaples before returning to England on the 24th October. His injury was reported in the Grantham Journal on the 23rd October 1915. He had been wounded in the head and had lost the sight of his right eye. On that date he was in hospital in Manchester and ‘going on well’. 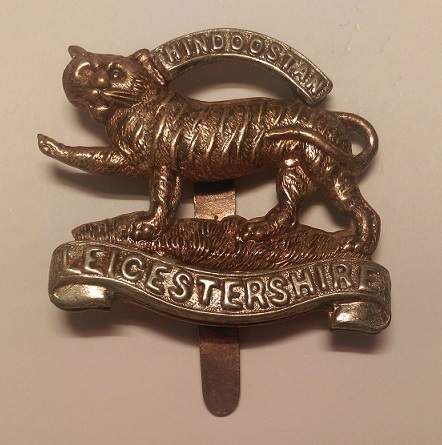 The 1/5th Battalion of the Leicestershire Regiment was part of the Territorial Army and first landed in France on the 28th February 1915. It became part of the 138th Brigade of the 46th (North Midlands) Division. It took part in the 2nd Battle of Ypres, and in October 1915 was part of the force attacking the Hohenzollern Redoubt, which is probably the action in which Leonard Barrand lost his eye. Following his hospital treatment, he was transferred to the 28th Lincolnshires on the 25th February, 1916, and again to the 13th Lincolnshires on the 1st January 1917, but through this period he remained in England and took no further part in active fighting. Leonard Barrand was discharged permanently on the 12th September, 1917, considered as “no longer physically fit for war service”, at the age of 23. He was described officially as of “very good character, a sober, reliable, intelligent man”. On his discharge from the army, he returned to Bottesford. Tragedy struck in December, 1919, when he died, aged 25. The cause of his death is uncertain, but he may have been a victim of the Spanish Flu. He was buried in Bottesford churchyard on the 10th November 1919 on the North side of the church in his brother Walter’s unmarked grave located to the right of that of William Barrand. The coffin was carried by ex-servicemen – W.J. Barrand, L. Lane, E. Culpin and W. Baker. He was awarded the 1915 Star, the Victory Medal and the British War Medal.